Fancy Gloss Polish is fast becoming one of my new favorite indie makers and these two polishes I’m showing you today will be reason for you to get on the bandwagon too! I am a little sad to show you polishes that are no longer available though. 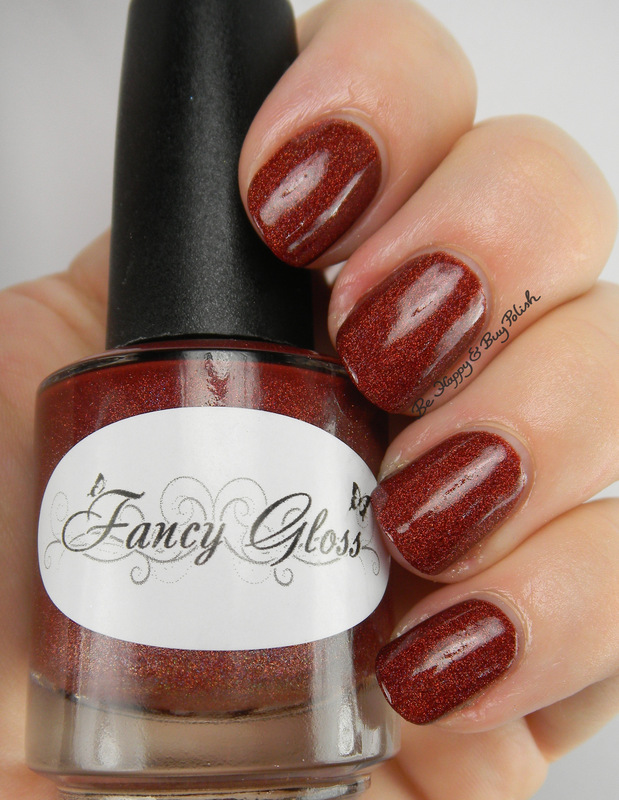 Fancy Gloss Red Velvet Mocha is a rich velvety red holographic nail polish. This is 2 easy coats plus top coat. Gingerbread Latte is a pretty much the exact shade of gingerbread houses. LOL! Again, this is 2 easy coats plus top coat. On both polishes, when I was removing them, I was left with a lot of silvery holographic residue around my nails. I’m guessing that there is just a lot of holographic pigment packed into each bottle of polish. Have you ever bought from Fancy Gloss before? Red Velvet Mocha looks so lovely! I swear I need all the reds ever made. wow. Those are so shiny! I don’t need another gold holo. Nope. Not me. I love that first shade, like REALLY LOVE it lol! Love both the colors, perfect for my skin shade! Look at the red! It’s so rich and warm! I love it! And I think these two would look great together, too. I love that red!!! Especially in the sunlight! These look super sparkly! I love them! Ohhhh I’m drooling! Absolutely must have these! Ohh I love both of these! !